Portland State University classes are back in session. New students walked around the school, some unaware of what happened to Jason Washington this summer. President Rahmat Shoureshi asked the family to quietly take down their makeshift memorial before the new students trickled their way on campus. 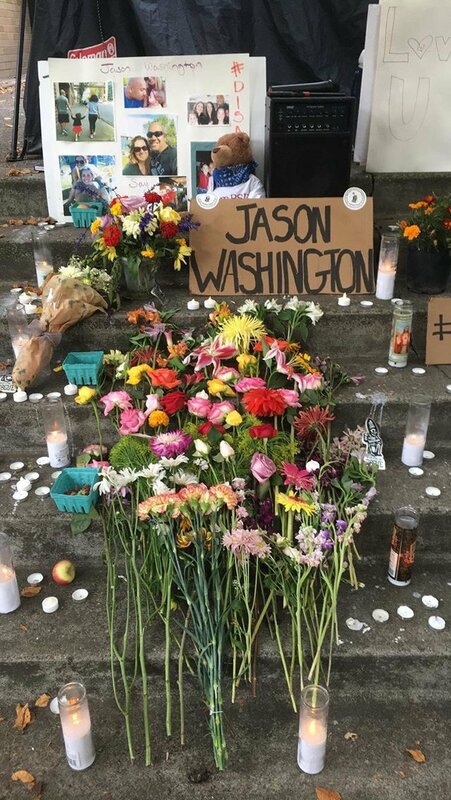 Portland State University tried to erase the memory of Jason Washington. The family refused. The PSU Student Union refused. The PSU community refused. The news of Jason Washington was heartbreaking for all of us. Meeting and working with Jason’s family has been a heartening experience. The resilience in their family is admirable and we place top value on the contributions of Jason’s friends and family. Together, we started building a movement and a permanent memory of Jason Washington. 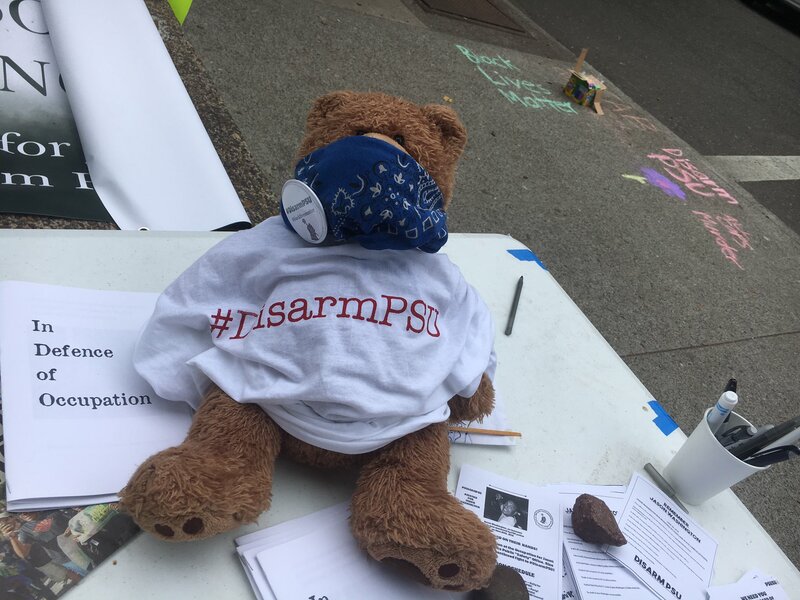 For three years, PSUSU tirelessly organized the Disarm PSU campaign. Disarm PSU launched July 1, 2015, the day the first four officers were armed and deputized. We have increasingly mobilized against the Board of Trustees. After years of being silenced by the Board, we felt an escalation was necessary. Last Monday was started like any other first day of classes. Students were bustling on campus, organizations were tabling in the park blocks, and PSUSU and Jason’s friends and family were doing last minute preparations for our noon rally. We started in the park blocks outside of the student union building. We had speakers from various organizations, students, faculty, alumni. We marched down to the place where Jason was murdered. The family and friends of Jason Washington paid tribute to their beloved. We marched up to the recreation center, where the Board of Trustees meet. Finally, we marched to the Campus Public Safety Office (CPSO) and announced we will occupy the space indefinitely. Banners dropped which said “Occupy PSU” and “Occupation for Jason”. Many attendees helped us set up, including former Occupy ICE folks. We had a strong show of solidarity later in the night during our vigil for Jason Washington. The next day we were bombarded by media and hosted an afternoon press conference. Things started to settle down a little bit on Wednesday as we settled in and started planning for the future. The occupation is full of wonderful visuals. We have signs hung up all around the building. We have flowers and candles on the steps. The area is filled with pictures of Jason. There is a large canopy. We have three tents in front of the doors. We have a few lining the streets. We have two tables set up. One is near the CPSO sign and the other is on the front steps. The tables have our stickers, patches, t-shirts, propaganda, and more! Donations come pouring in by excited and passionate supporters. We are absolutely amazed and appreciate all of the support we have received from the community and beyond. Things slowed down by the weekend, but we stayed the whole time. We had a vigil on Saturday followed by a small block party on Sunday. We were able to create more decorations for the space and screen print more t-shirts. 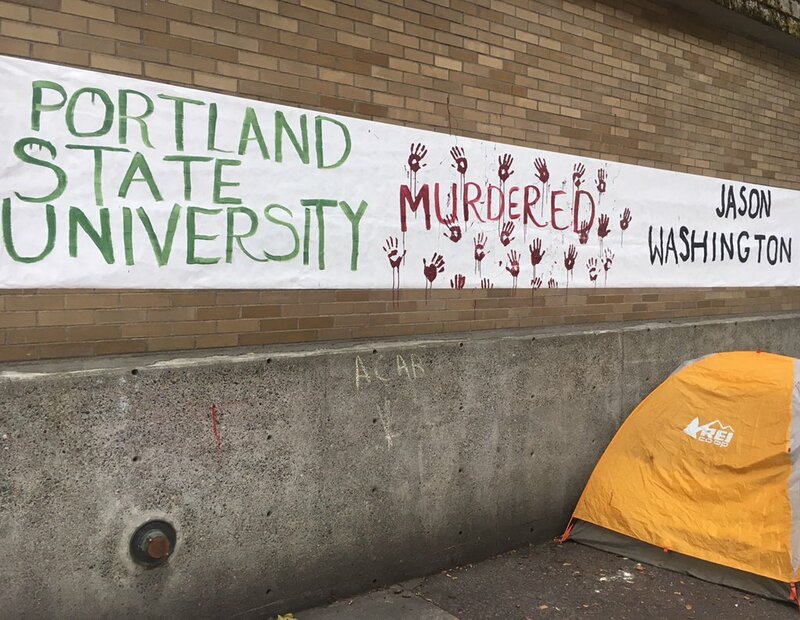 In the early hours of Monday, a week since the initial start, a few people came together to create a banner sprawled across the building which reads “Portland State University murdered Jason Washington”. As week two begins, we are ready to mobilize to the Board of Trustees meeting. We encourage students, faculty, staff, and community members to show up in solidarity with Disarm PSU and the Jason Washington memorial. Previous PostPrevious Call to Action: Solidarity with Occupy PSU!